Scientific parents are the real superheroes. In the Marvel Comics universe, Dr. Octopus is one of Spider-Man’s principal antagonists. 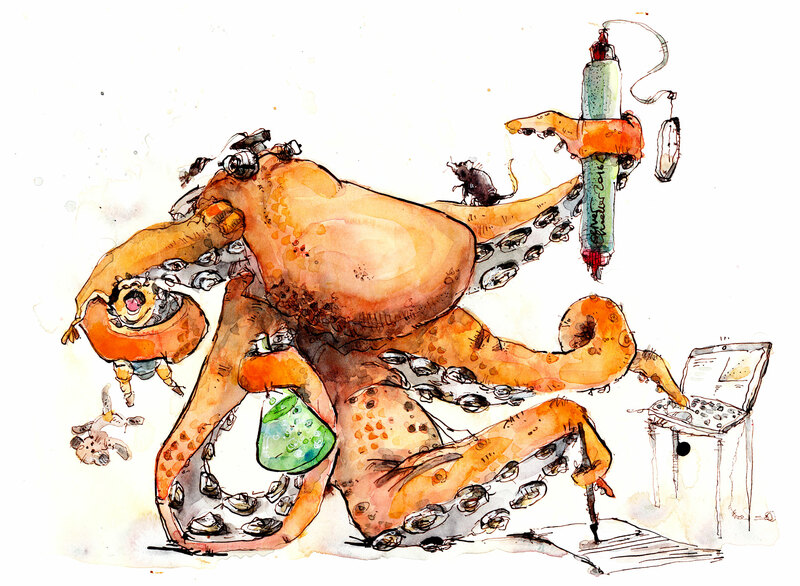 But there are plenty of real-life Dr. Octopuses out there – they’re called parents. The Marvel Dr. Octopus sports four prosthetic mechanical arms that triple his ability to manipulate objects. Scientific parents have to make do with the two that evolution bequeathed them, albeit usually strengthened from having to carry a toddler of several kilos on a daily basis. But it’s not the number or strength of hands and arms that are the basis for lab parents’ power – rather, it’s their ability to manipulate time. Time is a parent’s most precious resource, and the new father/mother quickly learns that when their time is no longer wholly their own, it becomes the rarest and most valuable of commodities. The parent has a wholly different perspective on time compared to non-parents – it’s no longer something that’s simply there, but rather something that has to be fought for and, once won, expended wisely and sparingly. Put simply, a parent uses time, while the non-parent spends it. The average person can afford to delay running a column, making a solution, updating a lab book or analysing data on a computer. They can afford to take long coffee breaks. They can also afford to haemorrhage working minutes on the BBC News website, Facebook, and, if they’re so inclined, the Premiership Rugby video highlights page. They can afford all this because they are time-rich, and extending their working day by two hours or more involves nothing more than changing their dinner plans. Parents are time paupers, and have little of the flexibility of their childless colleagues. Whatever tasks they need to accomplish have to be finished by the time they leave, because junior’s collection/playtime/dinner can’t wait. There’s no choice, so there’s no debate. The tasks get accomplished, because they have to be finished. From the outside, the parent’s ability to compress what looks like a 10-hour (or more) working day into their contracted hours may look like sorcery or superpowers, but it’s actually a reflection of much higher efficiency work ethic. TIR has argued in the past that one of the most pernicious fallacies in modern research is the equation of input with productivity. There’s no better refutation of this Old Lie than the quite remarkable productivity of lab parents. Originally posted on Total Internal Reflection - HERE. The 19th FEBS Young Scientists' Forum: apply now!